Crampons are fixtures designed to attach onto your shoes as you walk or climb. Crampons provide you with better traction on snow and ice. Some crampons are rigid and some are flexible, dependent on what classification of boots you are wearing. 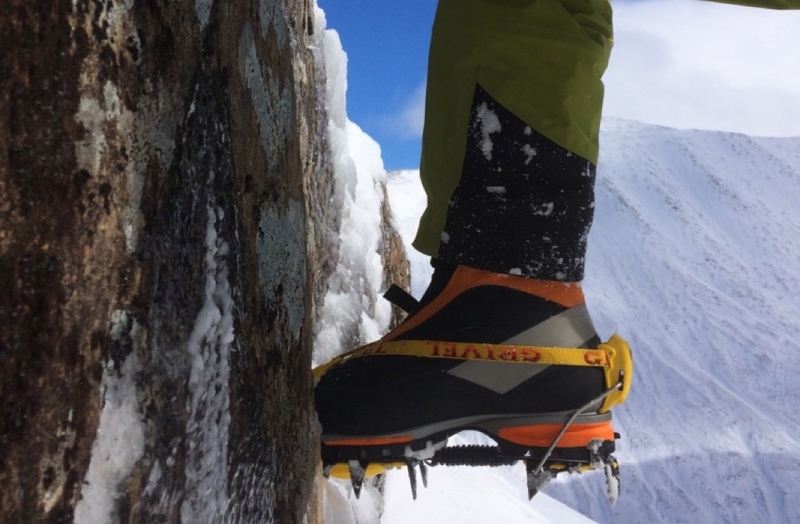 Some have specific snow repelling features, such as anti-balling plates made from ABS plastic that prevents snow from balling up in the crampon’s body, whilst other crampons are designed for use on specific climbs, with points that fit into small mountainside cracks, or front points that can disperse compacted ice. So before you decide what crampon to buy, you need to know what you will be using them for, depending on what you will use them for you need to have a compatible boot. Its already starting to sound like jargon. A crampon’s points are the spiked teeth that bite into the snow and ice. They are situated at the contact areas beneath the forefoot and heel. The majority of crampon points are made from steel or stainless steel due to its strength, though some lightweight styles for less aggressive use (such as ski touring) are made from aluminium, making them easy to carry. The amount of points affects the variety of positions in which a crampon can find traction. Crampons designed for activities involving gentle gradients such as glacier walking and ski touring will usually have 10 points. Those designed for more technical mountaineering will have 12 points – two protruding from the front – and those designed for technical ice climbing will often have 14. Almost all designs will have four points beneath the hell and the rest beneath the forefoot. Front points are points in front of the tow that actively disperse debris and ice or rock. For aggressive climbing conditions and Alpine routes, you need prominent front points. Most crampons have two front points for general purpose climbing, although technical route climbs may benefit from just one main front point for less weight and more precision. Horizontal or vertical points refers to the orientation of the front ‘teeth’ protruding from the front a crampon. Horizontal points look and act like a shark’s front teeth, providing excellent purchase on snow and softer ice. This makes them a great choice for winter walking and moderate ice routes, but unsuited to technical ice climbing. Vertical crampon points work like an ice axe, driving hard straight into the ice and giving a secure hold on mixed and more aggressive routes. They are the right choice for those looking for technical ice climbing crampons, but require a greater level of deliberate precision and give less stability on flatter sections making them unsuitable for gentler winter walking routes. Vertical points go with the grain of the ice, meaning there is less chance of the ice shattering or ‘blowing’. The construction of vertical points also means that front points are usually easily replaced. Recent years have seen brands creating crampons with hybrid or ‘T’-profiled points, resulting in a fantastically versatile system. These are effectively a vertical point with a horizontal profile at the top. Monopoints are best for mixed climbing, thin ice and anything technically difficult. They are extremely precise—they can stick to a small patch of ice, or a rock edge smaller than the edge of a 2 pence coin. You can also stick a monopoint into a small pocket or crack.